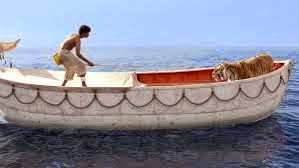 In struggling with the division that seeks to infiltrate the silence of my heart, I came to identify with the young man stuck on a tiny boat with a tiger in the middle of an ocean. How? Well, the answer stems from the idea that Pi's story is supposed to lead his interviewer to believe in God. Pi presents his story in two different versions. His first version is the one he chooses to believe: the story where, in the midst of chaos and peril, a hyena kills a zebra, then kills an orangutan, and then is himself killed by a tiger. 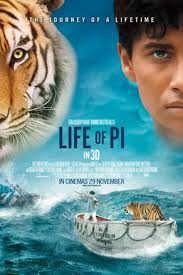 This tiger ends up being Pi's unlikely and unwelcome companion as he drifts about the ocean in waves of courage and despair. At first Pi is terrified of this tiger, doing everything possible to avoid and distance himself from this fierce beast. Eventually he hopes to tame the tiger, but realizes his only hope of survival lies in accepting this animal and situation for what it is. The two almost become friends. Pi even saves the life of the tiger on at least two separate occasions. When they part ways in the end, Pi remains heartbroken into adulthood, wondering why the tiger never even looked back to say goodbye after all they had endured together. However, each time Pi recounts this version of his story, no one believes him. 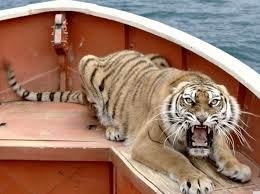 They all insist, "You could not have really survived at sea with a tiger. Tell us the true version." At the urging of two investigators from Japan, Pi gives us his second version: This time a cook kills an injured passenger, then proceeds to kill Pi's mother, and then meets his end when Pi kills him. The investigators listen in horror as Pi gives them the gruesome details, tears streaming down his face, as he describes watching his own mother die and then his own shocking and violent murder of the cook. By the end, the investigators remain stunned. "So, which version is true?" they wonder, not really wanting to fully grasp the horrific scene just illustrated for them. "Which would you rather believe?" Pi asks. When we are given the details of the report filed by the investigators, we learn they report the event as the first version Pi gives. When Pi asks his interviewer this same question toward the end of the movie, the interviewer also chooses to believe the first version. but deep down Pi knows that this will only result in his death. 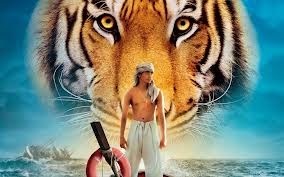 He decides to tame the tiger, but that also fails, so what does he do? He teaches himself how to co-exist with the beast. Pi is the tiger. The tiger is the side of this young man that emerged when Pi needed him to. In a moment of extreme pain and violence, Pi responded by taking the life of another human being. He acted in a way that shocked and scared him, so he tried to escape this side of himself he never knew existed and which he now did not want to exist. He attempted to put as much distance as possible between the person he had always been and the person he now saw himself to be. But it wasn't working. Neither did it work to try and tame this part of himself. Pi needed the new found strength and courage of this beast to survive, and so he integrated this creature into his person. Thus, as this side of him simply disappears when his journey at sea comes to an end (this journey representing a time in his life marked by excitement, confusion and loss), Pi is heartbroken. He had learned how to love this side of himself, and now it simply departs, never to be seen again. I have begun to examine my own stormy journey at sea. I have seen this tiger emerge, and so am trying to understand what to do with it. I have tried keeping it at bay, refusing to accept it as something that is a part of myself. I have tried taming it, pretending it could be made docile, perhaps invisible. But none of this is working. How do I integrate this tiger into who I am? And what is this tiger anyway? What is the beast I am attempting to escape? Hope comes in the fact that Pi learned to integrate his beast, even to the point of loving him. Hope emerges as well in the second part of the interviewer's concern: The idea that Pi's story is supposed to make him believe in God. As the movie comes to an end, Pi explains to his interviewer, "I gave you two versions of the story. I choose to believe in the version with the animals. You, and the investigators, choose to believe that version as well. I think God would also choose to see things that way." Could you imagine if the movie had looked the way Pi described it the second time around? Had we watched the cook kill an injured passenger and then kill Pi's mother, then later watched Pi kill the cook, we would have been horrified by all of the violence. Instead, we saw the first version, played out as something tragic, yet somewhat natural. We know that hyenas kill other animals and that tigers do the same, so it's sad, but it's a reality we can live with. Pi tells us that God also chooses to watch life played out as the version with the animals. Thus, God looks at our violence toward one another as something that is sadly a part of our nature rather than as something that is unforgivably brutal. And how is this supposed to help us believe in God? Well, who could not believe in a God so merciful? Who would not want a Heavenly Father that sees beyond our sins into the heart of who we truly are? By choosing to see things according to the version with the animals, Pi tells us, God is choosing to see our sinfulness as part of our human nature, but not necessarily as who we are. Reflecting upon some words of Louis J. Cameli, we are sinners, but we are not sin. We are murderers, but we are not murder. Who would condemn a tiger for killing? It is in a tiger's nature to do so. Thus, according to Pi, God says, "How could I condemn my children for sinning? It is in their nature to do so." Unfortunately, in this fallen world, we regularly see humans brutally killing humans. We see the violence; but God, in His mercy and compassion, chooses to see the tragic situations that lead us there. And so, my second source of hope is that whatever my tiger may be, I trust God sees the chaos which summoned this creature from deep within me. One day I will learn to integrate it, and then a day will come when perhaps I do not need its ferocity to survive. In the meantime, I seek to embrace it and discover its role in my life. If you have not yet seen the movie I hope I did not give too much of it away, but I highly recommend you watch it (or read the book). May we all learn to see our tigers as the result of our difficult journeys and so live with mercy and compassion the way our Heavenly does.